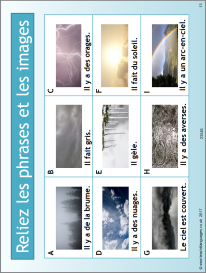 This PowerPoint is packed with activities to introduce and practise weather phrases, based on the weather in Quebec. It also includes points of the compass. Great photos, 4 tenses covered. Used with top set Year 9 and also a Year 10 class. This is lovely! It would be great to have a similar resource about a warmer area too. Will be using this with my GCSE class.